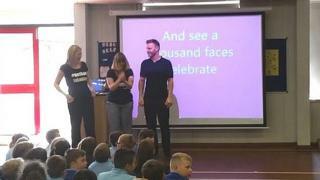 Take That singer Gary Barlow has made a surprise appearance at a Tyneside school to help staff and pupils say farewell to two teachers. Nicola Burton and Catherine White are leaving Lobley Hill Primary School in Gateshead after a combined 20 years. The school launched a social media campaign to persuade the singer and former X Factor judge to "drop in". He was greeted with a rendition of Sing, the song he penned for the Queen's Jubilee in 2012. The school launched a #getgarytolobley campaign to coincide with Take That's appearance at the Metro Radio Arena on Friday. The singer said: "I've had a lot of campaigns this year because of all the weddings we've been doing, but this one in particular has been exceptional. "It's been a long campaign but today I hope it has been worth it for everyone." A school spokeswoman said everyone had been "totally blown away" by the star's visit.